Do you have a horse or equine related website that would interest our visitors? If you have a quality horse website that might be of interest to our visitors, please contact us to have your link added to this page for free! Pasture Vacuums offers a free reciprocal link exchange program for quality horse web sites. 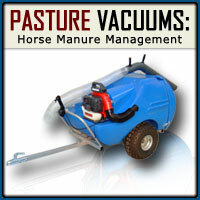 Please right click on our banner below and add it to your website linking to www.PastureVacuums.com . Once you place our link and banner on your website, please send us the location and we will place your link and banner on this page once you are approved. Only quality horse websites will be accepted. Speedrite - Perfect for all your horse and livestock fencing needs. FoxHuntingShop.com offers choices in English riding and fox hunting apparel, hunt appointments, hunt top boots, breeches, tack, bridles & English saddles.